WASHINGTON — U.S. President Barack Obama briefly interrupted his vacation in Martha’s Vineyard to address concerns about the rising violence in Egypt. Reuters reports that the impromptu press conference was held barely into Obama’s vacation in the wealthy Massachusetts island. The Egyptian military had toppled the Islamist government led by Muslim Brotherhood President Mohammed Morsi, and put him in military custody. Millions of Egyptians protested Morsi’s policies and their voices were heard, but not by the liberal mainstream media. Morsi was replaced by an interim government, staffed by Egyptian liberals and secularists such as former U.N. nuclear agency chief Mohamed ElBaradei. Islamist Muslim Brotherhood supporters were furious and protested the decision, camping out in Cairo streets and squares. The Egyptian security forces moved in to disperse and removed them by force, if necessary, when the bloodshed began. Now cities are rioting and it is a full-blown internal conflict. The White House’s official Twitter account posted a picture of Obama on the phone with a stern face, saying “President Obama on the situation in #Egypt”. Conservatives mocked Obama for another staged photo-op, just as he did on the night that terrorist mastermind Osama bin Laden was killed by U.S. special forces. 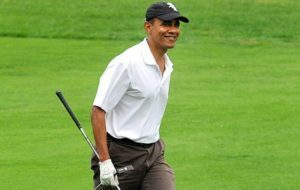 Then Obama went back on vacation, with some people on social media joking he was headed back to the golf course.